In recent years, epilators have become a popular choice for hair removal among women. New technology has made these machines more effective and less expensive, which has lead to a dramatic upswing in their popularity. But how well does epilation work and is it worth purchasing an epilator? Read this helpful guide, and check out the best epilator reviews by the women who use them, to discover which epilator is right for you. If you’re considering purchasing an epilator you might be wondering — how do they work? How do you use and maintain them? What are the advantages of epilation compared with other methods of hair removal? And if you do decide that you’d like to give epilation a try - which brands and models should you consider purchasing? Epilators are electrical devices that can be used to remove hair from anywhere on your body. The mechanisms of an epilator work by using rotating discs or springs that grab multiple hairs at a time, creating a tweezing effect and pulling out body hair by the roots. Plucking hairs out in such a manner leads to a similar result as waxing, but doesn’t remove the outer layer of dead skin. Epilators can also be more efficient because they are less likely to flatten hairs, which can lead to missed patches when waxing. Epilators are easier to use and very affordable, especially over time. You can use an epilator on any part of your body including legs, arms, underarms, bikini areas, and even your face. Epilators are also very easy to use and can be used over and over again, unlike razors or waxing kits. Also, if you miss a spot while epilating, it is super easy to go over that same spot again to ensure you haven’t left any stray hairs behind. There are many models of epilators available on the market. Some come with cords, while other models are rechargeable. And these days you can find both wet and dry epilator models for increased convenience. It’s quick and easy to learn how to use an epilator. Just be sure to read your manual carefully and follow these basic tips and you’ll be sure to get great results. To avoid irritation and ingrown hairs, always clean and exfoliate your skin before using your epilator. Taking a warm shower will help to open up your pores, and exfoliating to remove any dead skin cells will help reduce irritation and the chance of ingrown hairs. If you’ll be using a dry epilator be sure to dry your skin off carefully before you begin to use the epilator. As you begin, make sure to hold your skin taut with the epilator at a 90-degree angle. Be careful to move the epilator slowly and steadily, moving in the opposite direction of the hair growth. It should take about 15 seconds to move from your ankle to your knee. Afterward, make sure to apply a soothing cream to moisturize your skin and help reduce any redness or irritation. Continue to exfoliate regularly as the hair grows back to avoid ingrown hairs. Wet epilators are becoming increasingly common and are less likely to irritate your skin than dry epilators. As with any type of epilation, be sure to wash and exfoliate your skin before you begin the process. If you're using a wet epilator, you can apply a cream or gel, which will help to reduce any possible pain. We recommend using a product that is gentle and won’t irritate your skin. The best gels to use when you are are epilating are those that are hypoallergenic and won’t clog your pores. Products with these qualities help to soothe your skin during epilation without causing any stinging or discomfort. Using warm water during the process will also help to open up your pores, while also reducing any pain and decreasing the likelihood of hair breakage. Afterward, always make sure to apply a soothing cream to help reduce redness and irritation. Some of the best creams to use following epilation include witch hazel. This is because these creams contain anti-inflammatory compounds, which help to relieve any pain after the process is completed. Witch hazel also helps to clarify the skin and shrink the pores. Epilators can be the most convenient and affordable method for hair removal. You will be able to use your epilator for a long time, over and over again and a high-quality model can last you for years. This means you won’t need to replace blades, like you would with razors, or buy kits often, like you would with home waxing kits. And you definitely won’t be spending nearly as much money as you would if you were getting professionally waxed. Because epilators pluck the hair, you’ll be able to go two weeks to a month without repeating the process, compared to shaving which needs to be done every few days. While waxing also removes hair from the roots, you have to wait for quite a while for the hair to regrow before you can wax again. Epilating, on the other hand, can be done effectively with hairs that are as short as 0.5mm so you won’t have to wait so long between sessions. While the word “epilator” may be a bit intimidating, the process is easy and effective once you get the hang of it and you'll be surprised to learn how affordable they are. You can purchase an epilator for around $30-50, with the priciest ones coming in at $100. With the convenience, ease, and a low price of epilation — what more could you want? If this all sounds good to you then it’s probably time to give epilating a try. It might very well be your best bet when it comes to hair removal. Now that you know more about what an epilator is and its benefits, the question is whether epilation really provides a suitable alternative to waxing. There are both pros and cons to using an epilator and honestly, there can be no absolute choice for all women because each woman has varying preferences and needs. However, we can compare the two processes by examining these factors: time, convenience, the level of pain, maintenance, and required skill. When time is a factor, getting waxed at a salon can be quicker than using an epilator yourself, which can take up to an hour. However, if you’re waxing at home that process can be just as time-consuming, with messy cleanup. However, both processes become quicker over time. When it comes to convenience and maintenance, epilators tend to come in first. Epilation can be done at any time, even with very little hair regrowth (as little as 0.5mm), and it’s easy to touch up if you missed a spot. You also don’t need any preparation to use an epilator and clean up is very quick and easy. The question of pain is subjective and there are strategies to minimize pain whether waxing or epilating. Using a slower speed on your epilator, making sure you exfoliate and wash with warm water to open your pores, and ensuring that you hold your skin taut during the process are all strategies that reduce the pain of epilation. As for skill, waxing can be a difficult skill to learn properly and experts suggest that you learn from a trained professional before using home waxing kits. Epilators, on the other hand, are incredibly easy to use, especially if you read the manual and use the helpful tips described in this article. So what’s best, epilating or waxing? As we examine these pros and cons, the epilator certainly does show a lot of promise. At the end of the day, if you're looking for the most convenient option with the greatest ease of use, then the epilator can be the better choice for you. The first step in deciding which epilator to purchase is to ask everyone you can. Go to your girl friends and get their recommendations regarding the brands and models they use. Once you’ve done that, it’s time to get online and get connected to the thousands of women who have used different epilators and shared their comments in reviews. Take your time browsing these reviews and make sure to look and different brands and models. Which reviews have been the most helpful to other women and what did they have to say? This will give you a better idea of what brands and models should be included on your shortlist. When considering the best epilator to use, be sure to consider these factors: brand, basic features, extra features, usage (wet or dry or both), with cord or cordless, and the price point. At this point, you’ll probably have a good idea of which epilator fits your needs, convenience, and budget. High-frequency massage: Provides a comfortable experience by stimulating the skin. Pivoting head: The pivoting head easily follows every curve of your body to reach all hairs with a gentler feel. SmartLight: This built-in flashlight helps with the removal of even the tiniest and finest hairs. 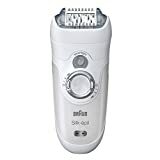 Shaver head: Having a shaver head as well as a trimmer cap makes this epilator multi-use. Conclusion: If you’re just starting out and aren’t sure an epilator is right for you this basic epilator is a great place to start. It’s easy to use and affordable, with a number of special features. This is the lowest-priced model of Braun epilators. Despite its low price, this model has all the basic features that make Braun epilators the most highly rated among women, including 40 close-grip tweezers, massage rollers, and the ability to be washed. This model also includes extras such as a shaver head, trimmer cap, efficiency cap, and a cooling glove (to be used before and after epilating). If you’re after a basic and efficient model, the Braun épil 5 5-280 might be a great first epilator for you. This epilator is both easy to use and easy to clean. It also has two speeds, which provides more control. This model is pretty simple but has all the features you need to get the job done. The useful built-in LED light is very helpful and ensures that you don't miss even one hair. With its 40-tweezer mechanism, the majority of users found this model to be very accurate for locating and plucking out hair, avoiding the necessity of having to go over the same area again and again. This model has a cord requiring it to be plugged in at all times, which can be inconvenient. This model is for dry epilation only so you can’t use any creams or water during use. This model had a tendency to occasionally pinch the skin, though this can be avoided by holding the skin taut. Finally, hair can build up in the model, which does affect its accuracy. While this model is easy to clean, it can be an annoyance. Two-Speed Epilator: This model has 2-speed levels—gentle and efficient. The gentle speed can be used for sensitive zones such as underarms and bikini lines. Efficiency Cap: This cap protects from nicks, cuts, and irritation making the Philips Satinelle perfect for people with sensitive skin. Ergonomic Grip: The ergonomic design allows helps you move this epilator smoothly over your skin. Easy Operation & Cleanup: The epilator head is easily removable for simple cleaning and maintenance. Epilates Multiple Hair Lengths: While optimal epilation requires 3 to 4 mm hair length, you can remove hair as short as 0.5 mm with this epilator. Conclusion: If what you’re after is an affordable epilator that gets the job done then this Philips model may be perfect for you. This is also a great option for travel because it is compact and lightweight with a sleek design. Since this model doesn’t cause much pain, it’s a great place to start out. You’ll be sure to have a smooth experience with this model. First and foremost, this epilator is very affordable. Due to the low price, this is a great starting model for anyone who isn’t sure they are ready to invest but want to give epilating a try. One thing users love is that this model doesn’t cause very much pain, even during the first use. The ergonomic design and light weight give you great control during the hair removal process. The Philips epilator doesn’t always work as accurately or efficiently on thick, coarse hairs, which means it probably isn’t the best choice for underarms or bikini lines. You might have to go over the same area a few times to ensure hair is properly removed and this model has a tendency to leave behind a few broken hairs. Users found it a bit difficult to clean. 72 Tweezer Heads: The Emagine is packed with 72 tweezer heads, making it optimally efficient at removing hair including any lingering or flat-laying strands. Antimicrobial Protection: The Emagine is the first ever epilator to offer Silver Ion Technology, which provides a safe and healthy epilating experience. 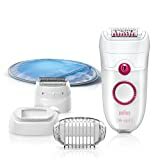 Prevention of Ingrown Hair: This epilator has "lifting fingers" that actually lift short and flat strands during epilation so that nothing is left behind. User-Friendly Operation: The ergonomic designed and an easy-to-use operation system make this perfect for women on the go. Conclusion: The Emjoi is a basic epilator and somewhat pricey. However, if its efficiency that you're after then the 72 tweezers may be its biggest advantage. However, if you would prefer other add-ons and special features you may want to look elsewhere. The Emjoi Emagine has 72 tweezers which is the most tweezers you’ll find in an epilator. The Emjoi doesn't have a built-in light system. This isn’t a big problem but would certainly be useful for removing any stray hairs. This model works well on larger areas but not on more sensitive areas such as your face. Given the price, we’d expect the Emjoi to have more special features, such as being cordless and waterproof, but it doesn’t. The Braun Silk-épil 7681 may be one of the most expensive epilators on the market but with all the special features and rave reviews we think it might just be worth it. Speed personalization: With two speeds, one for extra-gentle epilation and one for high-efficiency, you have great control with this epilator. Pivoting head: The head can pivot up to 15 degrees to easily hug the contours and curves of your skin and body. SoftLift tips: These are useful for lifting up flat hairs and leading them to the tweezers for removal so your skin will be smooth as can be. Smartlight: This built-in flashlight helps locate even the tiniest and finest hairs. High-frequency massage: Provides a more comfortable and soothing epilation experience. Close-grip technology: This epilator has 40 tweezers that are engineered to grip and remove hair as short as 0.55 mm. Wet & dry: This epilator is very versatile and can be used in the tub or shower, preferably with warm water and a cream or gel, for a more comfortable epilating experience. Cordless use with fast recharge system: A fully charged battery can last for up to 40 minutes of use. Conclusion: This is one of the most versatile and multi-use epilators available on the market and there's no doubting its durability over time. Most inexpensive epilators will last for over a year, but this users have raved that this model has lasted for as long as a decade while maintaining the high quality and performance it had on the day they bought it. If you’re looking for an all-in-one epilator and are committed to this method of hair removal then this may be the perfect epilator for you. This model is a great choice you both first-time users and epilator-lovers alike and is worth the investment. This model has some of the highest reviews and many women love to use it. You can use this model on your entire body, including your face. Being cordless and waterproof provides great flexibility and efficiency. To top it all off, the Smartlight helps you to locate even the smallest of hairs and the epilator can be charged for up to 40 minutes of battery life in one go. This ensures you’ll get the job done efficiently and effectively. This model is a bit pricey, especially given that there are a number of epilators that come with a more affordable price. The SmartLight is great for locating unwanted hairs, but it can be a bit bright. We would prefer a model where this feature can be switched off when it isn’t needed. Based on Braun Silk-épil reviews, this model is another great contender for the best epilator on the market. High-frequency massage: Provides comfortable and soothing epilation experience. Pivoting head: This pivoting head easily follows every curve of your body to remove all hairs with a gentler feel. Shaver head: The inclusion of a shaver head, as well as the trimmer cap, makes this epilator multi-use and efficient. Close-grip technology: This epilator has 40 tweezers that are engineered to grip and remove hair as short as 0.5 mm. Conclusion: With a reasonable price, high-quality performance and all the great Braun features, we highly recommend this Braun epilator. If what you’re after is a high-quality, versatile model from a dependable brand then this epilator might be a great find and investment for you. So what's the verdict on this one? Most women who have used it have great things to say. Being both waterproof and cordless, with a long battery life, this model is versatile and convenient. 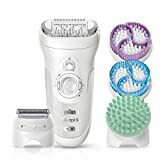 With Smartlight technology, a massage head, and most of the features you’d expect from a Braun epilator, this model’s lower price makes it a great bargain. Some people have found this model a bit more likely to catch their skin, but this can be prevented by holding the skin taut and following the instructions. This model can be a bit noisy. For the most part, women love this brand and model, however, and some users have sworn by it for over a decade. Like all epilators, using this can be a bit painful to use at first, but as time goes by, the process becomes much smoother. This remains true for this Braun epilator. Epilators are quickly becoming a top contender for the best choice in women’s hair removal. With new technologies and special features, why not give epilation a try? When deciding which epilator is best for you, be sure to consider different brands and models. It’s better to invest in a well trusted brand that many women have given positive reviews. Remember, this is an investment for you and your body and you’re going to want to choose something reliable, effective and convenient. With that in mind, Braun epilators are certainly a good choice, especially if what you're looking for is the very best quality and value for your money. Make sure to take the time to look more closely at Brau﻿﻿n Sil﻿﻿k-épil r﻿﻿evi﻿﻿ews to get a better sense of the model that best suits your needs. Remember, everyone is different, with different preferences. You know your own body and needs. Be sure to take the time to figure out which model is best for you, and consider your options before you make your purchase. This will help you to chose an epilator that keeps your skin smooth and hair-free, over the long term, with efficiency and convenience. How To Remove Makeup Fast And Naturally Without Makeup Remover. Girls, I too long suffered with the epilator and ingrown hair, but now found a suitable in all parameters option. Remove hair on the unit Iplaser Innovatione. Worried that can be spots, but after 6 treatments on different areas of skin has not changed. The device is really effective! Of course, it’s not a domestic procedure and need a qualified technician, but the result will exceed your expectations. I really hope this will help to make skin better, attractive and more comfortable. I recommend these produst for all women.